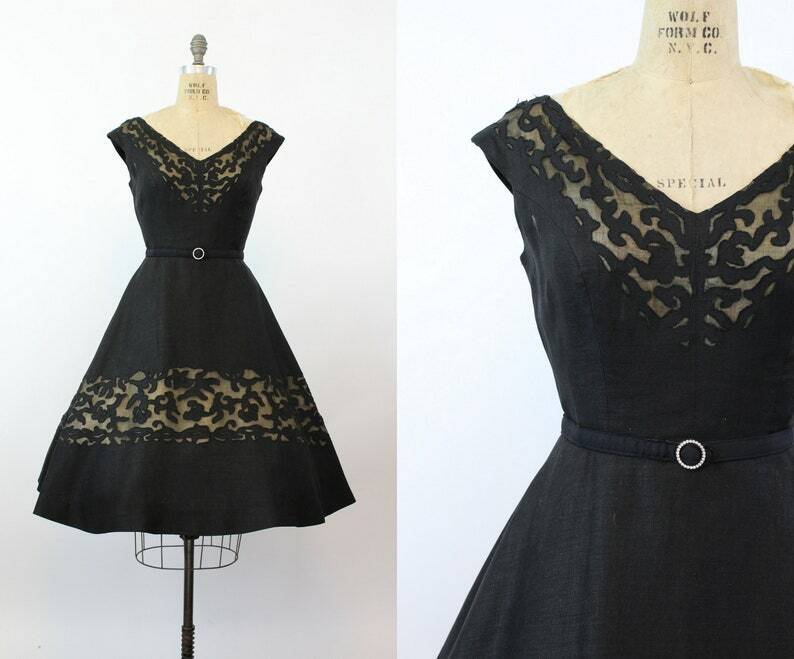 Exquisite couture-like 1950's dress! So many quality and intricate detailing on this black linen. Linen is heavy with cutouts on the bodice and skirt. It is backed in a silk organza. Sharp v neckline, cap sleeves, fitted waist and full skirt. Back metal zip. Bodice is lined in the silk organza. Skirt is lined in the organza also and has a satin slip with tulle hem. Dry cleaned and ready to wear! Belt not included. Condition: Very Good Vintage: Organza that lines the linen has aged and yellowed in spots a bit. Not seen when worn. Tiny mend made to top of strap at the edge, not noticeable unless pointed out. Organza has some wear on the back edge of bodice on one side. Bust (underarm seam) : 37"